In recent weeks some of the nation’s biggest media outlets have turned their eyes toward seafood sustainability—a subject that can be as slippery and tough to pin down as a fish flopping across the deck of a pitching and rolling fishing boat. As consumers and corporate buyers allow sustainability ratings to drive more of their purchasing choices, it’s becoming increasingly important to know who is doing the rating and how they’re arriving at their decisions. The ultimate goal of such programs is to allow the market to drive behavior; in this case, the manner in which fishermen go about the business of fishing. But if doing so makes it impossible for fishermen to maintain their business, then the ratings are forfeiting one of the inherent goals of sustainability: the availability of fish over the long term. Two recent pieces in the national news media expose some of the problems with the current piecemeal system of sustainability ratings that establish guidelines with no clear accountability to any third-party source. 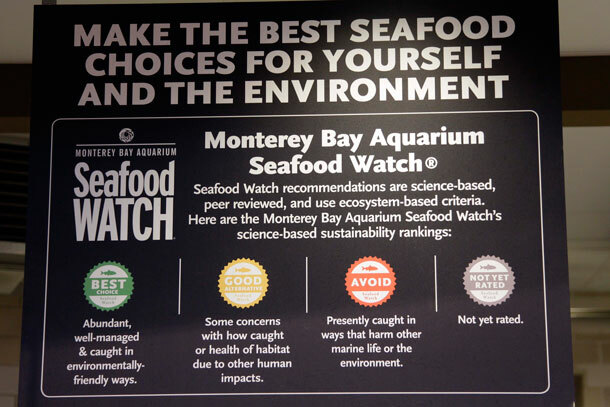 The New York Times’s Abby Goodnough analyzed a decision by the organic supermarket chain Whole Foods this month to no longer sell seafood not certified sustainable by the Marine Stewardship Council or if it was red-listed by either the Monterey Bay Aquarium’s Seafood Watch Program or the Blue Ocean Institute. And The Washington Post’s Juliet Eilperin probed questions about the credibility of such labeling in the first place. Absent a clear definition of the word “sustainability,” Goethel’s point is actually well taken. Each organization has its own criteria for what constitutes a sustainable fishery. These are typically available on their websites, but they often require an advance degree to decipher. The Seafood Watch Program’s formula for determining a final rating is laid out in a 74-page document that includes seven pages of references. That’s not a criticism. I’m glad scientists are attempting to sort through these issues. But when multiple organizations come up with multiple answers to the question of what defines sustainability, it’s hard to know who to trust. It doesn’t help consumers when the methodologies aren’t written in plain English. Even in the products developed for consumer awareness, the answers aren’t simple. The Seafood Watch Program’s wallet card for the northeast region can seem self-contradictory. One species, Atlantic cod, appears in all three categories—best option (green), good alternative (yellow), and avoid (red). Canadian and U.S. Atlantic cod is red, Gulf of Maine hook-and-line caught Atlantic cod and imported Atlantic cod are yellow, and imported hook-and-line caught Atlantic cod is green. Yet even these complexities fail to tell the whole story. Last month I wrote about the New England hand gear (hook and line or harpoon) bluefin tuna fishery. No one will argue bluefin is overfished, but not all overfished fisheries should be classified as unsustainable, and this one proves it. Yet any pocket guide will default to putting bluefin tuna on the red list. Less than a year later, when the chain opened a store in the heart of lobster country, Portland, Maine, it made an exception, though it still requires employees to electrocute the lobsters before shoppers take them home to prevent the animals from being boiled alive. Whole Foods’s decision to cast its sustainability lot with national organizations that fail to account for the localized impacts of their policy pronouncements also speaks directly to the broader problem of the consolidation of our food-purchasing decisions. Policies set at a corporate level will inherently be made in the best interests of the company. Environmental health or animal cruelty issues may play a role, but at the end of the day the decision will come down to what’s best for the company’s bottom line. Programs that encourage consumers to steer clear of fish caught by fishermen using legal methods, like trawls, and adhering to scientifically based catch limits may have the unintended consequence of bankrupting some fishing operations by taking away their market. Not all fishermen will be able to eke out a living using gear that some may consider more environmentally friendly. Part of ensuring a sustainable future for the seafood industry means maintaining access for fishermen who operate under scientifically defined catch limits, and then identifying their products with clear, verifiable, traceable labels. In sum, organizations like the Gulf of Maine Research Institute that develop policies accounting for regional specificity are inherently better equipped to understand and explain their local fisheries than even the most well-intentioned national group. And local fish mongers know far more than a supermarket manager what fish will best meet his or her customer’s needs. So if you’re really looking for a sustainable fish dinner, bypass the big box store all together and make an extra stop at a fish market on the way home.